Weighty Matters: Canadian stimulus package funding gigantic ribfest?! Canadian stimulus package funding gigantic ribfest?! Yup. 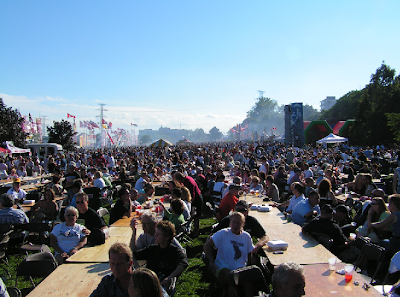 That's a picture of last year's festivities and according to a report in the Globe and Mail, "Canada's Largest Ribfest" is set to receive federal funding for being a "marquee tourist event". The ribfest, slated for September 3-6th in Burlington, boasts that last year 175,000 people consumed 150,000lbs of ribs. Indeed, that does sound like a marquee tourist event, but really, should the government be promoting it? Having attended a few ribfests in my time I can tell you, they're not events that focus on moderation and the average rack of smoky barbecued ribs will contain in the neighbourhood of 1,000 calories and 4,000mg of sodium. Add some sides to that and most ribfesters will consume a day's worth of calories and likely 4 days worth of sodium in a single meal. Remember too it's now abnormal in Canada to have a healthy body weight. Childhood obesity rates have tripled in the past 30 years. Healthcare expenditures are skyrocketing and dire predictions of the end of socialized medicine come more and more frequently. While I think events like ribfests can be a lot of fun, I do find myself scratching my head to learn that the government thinks selling horribly unhealthy food is something they should be doing with my tax dollars. I'd complain, but no one would listen.